How to decrypt encrypted RAR/WinRAR files? Wanna decrypt or unlock encrypted RAR/WinRAR files? RAR Password Recovery will be good assistant for you! 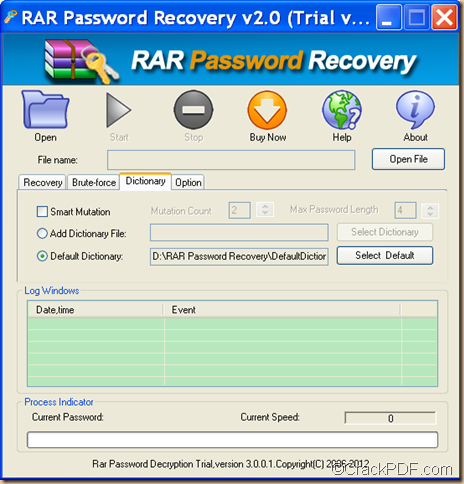 RAR Password Recovery is a practical password recovery tool that can decrypt RAR achieves protected with passwords. 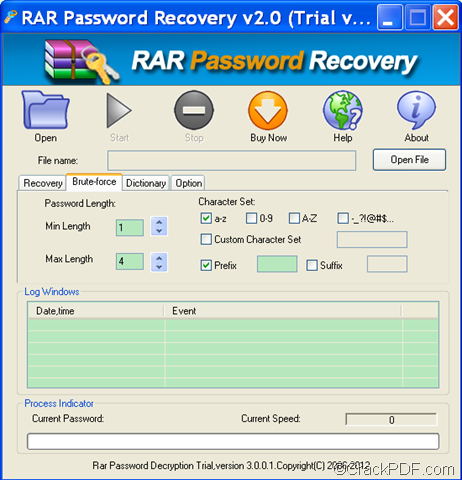 To know more about RAR Password Recovery, welcome to visit the homepage of RAR Password Recovery. Firstly, download RAR Password Recovery and install it on your computer. Secondly, add the locked RAR files by clicking the Open button or the Open File button on the main interface. Thirdly, switch the default mode to the dictionary mode. To switch to the dictionary mode, please check the radio button of “Dictionary Attack (Recommended)” in the “Type of Attack for Documents with Strong Encryption” group box of the “Recovery” tab panel. Then, please click the “Dictionary” tab on the interface to open the “Dictionary” setting panel. The following is a snapshot of the “Dictionary” setting panel. On this interface, you can reset the default dictionary by checking the radio button of “Default Dictionary”, and clicking the “Select Default” button on the interface. On this interface, you can add a new dictionary by checking the radio button of “Add Dictionary File”, and clicking the “Select Dictionary” button on the interface. On this interface, you can set the mutation count and max password length by checking the radio button of “Mutation Count”, and inputting numbers into the corresponding editing box or adjusting it by clicking the corresponding up-down button. Lastly, start to recover the password for the RAR achieves by clicking the Start button on top of the interface. Then, RAR Password Recovery will start to decrypt the encrypted RAR achieves!